THE THRILLING ADVENTURE HOUR #1, kicking off an all-new series from creators Ben Acker and Ben Blacker, along with rising star artist M.J. Erickson, in July 2018. In this new monthly series, based on the wildly popular Hollywood stage show and podcast, Frank and Sadie Doyle are the toast of the upper crust - headliners on the society pages…and they see ghosts. When one night of having a drink (or ten) with friends goes horribly, and perhaps predictably, wrong at a haunted house, the Doyles find themselves in a situation beyond belief. 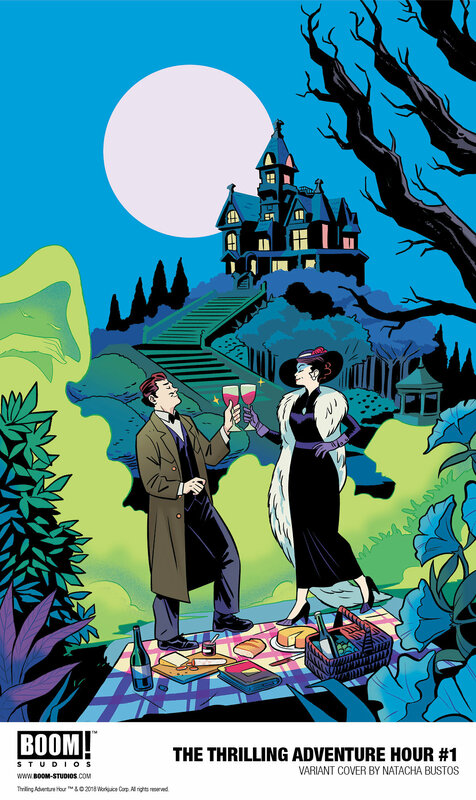 THE THRILLING ADVENTURE HOUR #1 and THE THRILLING ADVENTURE HOUR: A SPIRITED ROMANCE DISCOVER NOW EDITION will be ON THE SHELF in July 2018 exclusively at local comic book shops. Are you a fan of The Thrilling Adventure Hour? Let us know in the comment section below. Also, don’t forget to like, share and subscribe to all things Constant Collectible in order to keep you up to date with all the news & reviews from the world of GEEK CULTURE.